There are many reasons why I love writing about food, but finding out about new products before the general public has to rank as number one. I absolutely love knowing about new things before everyone else! I get a certain sense of satisfaction when someone tells me about this great new product they found while grocery shopping and I can look them in the eye and say "Yeah, I know all about that". Breakfast Blend-Soothingly smooth, mild roasted flavor ready whenever, wherever you are. Columbian-100% Columbian coffee taste ready whenever, wherever you are. Black Silk-Unbelievably bold, yet exceptionally smooth flavor ready whenever, wherever you are. All three varieties are available for purchase in 7 count packages and can be found in the coffee aisle at most major grocery chains. 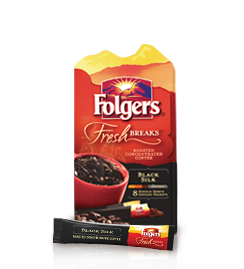 To enjoy a hot, fresh cup of coffee wherever you are, add a packet of Fresh Breaks to a mug or cup, stir in hot water or milk and enjoy!